The Poulos & Bennett team sported their best pink attire on Friday, October 20, 2017, for Annual Wear It Pink Day. 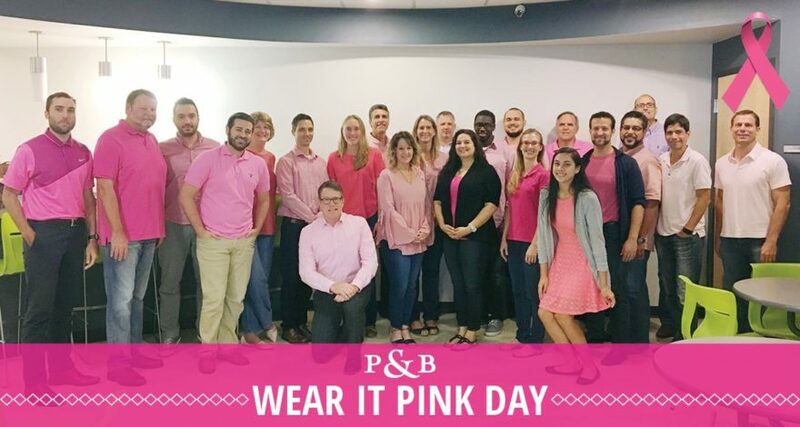 From colorful socks to radiant pink blazers, our employees were proud to show off their pink attire in support of Breast Cancer Awareness and Research. Poulos & Bennett is a strong advocate for Cancer Research. Earlier this month, P&B made a contribution to Tijuana Flat’s Just In Queso Foundation for each of its employees. We also plan to participate in the Central Florida Susan G. Komen Race for the Cure this February.